Does a stock's dividend seem too good to be true? If you're a dividend investor, higher yields are obviously desirable. However, not all high-yielding dividend stocks make good investments. In fact, some can be quite dangerous. A stock with a dividend yield that's too good to be true is known as a "dividend yield trap," or simply a "dividend trap" or "yield trap." Here's how you can spot and avoid dividend yield traps, and what you should look for instead. Unusually high yield: The most obvious sign that you might be looking at a dividend yield trap is a dividend yield that seems unusually high. To be clear, this isn't a 100% effective way to detect a yield trap, as many stocks pay high yields for completely legitimate (and sustainable) reasons. For example, some companies, such as REITs and MLPs, are required to distribute a certain percentage of their income. Excessive debt: The more debt a company has, the higher the likelihood that it will need to cut its dividend during a tough economy. One effective way to evaluate a company's debt load is to look at its debt-to-equity ratio, which you can calculate quickly with information found on the balance sheet. For the most valid comparison, look at the debt-to-equity ratios of companies in similar industries. Little or negative cash flow: Sometimes earnings can be deceiving, due to things like one-time accounting items. So, another way to assess whether a dividend is too high is to compare it to a company's cash flow. Simply put, cash flow is the difference between the money coming into a business and the money going out of the business. All public companies issue cash flow statements, so this information is rather easy to find, and in many cases can be more useful than evaluating earnings. Problems with the business: Finally, another reason a high-dividend stock can be a yield trap is if there's something wrong with the business itself. 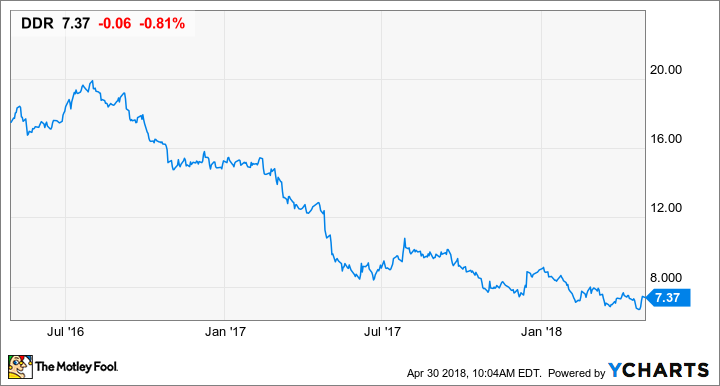 One thing to check is the stock's price performance over the last year or two -- if the high dividend yield is due to a rapid decline in the stock's price, it's a good idea to look into why the stock's price dropped so much. Another potential indicator is declining earnings, or slowing earnings growth. DDR Corp. (NYSE:DDR) is a real estate investment trust, or REIT, which specializes in shopping center properties. Based on its current stock price, DDR yields more than 10.2%. However, REITs tend to have higher-than-average dividends, so let's take a look at some of the other indicators listed above. For one thing, DDR has a rather high level of debt. At the end of 2017, the company had $3.9 billion in debt, which is quite high for a REIT with a $2.7 billion market cap. In other words, debt makes up about 60% of the company's total capitalization. For comparison, most solid REITs have debt-to-capitalization ratios of 40% or less. Furthermore, the company estimates its FFO at $0.15 for the third quarter, while its quarterly dividend rate is $0.19 -- an FFO payout ratio of 127%. And if you look at a two-year chart of DDR's stock price, you'll notice a sharp decline. The simple explanation is that DDR has significant exposure to struggling and bankrupt retailers, such as hhgregg and Toys R Us, and also suffered from the Puerto Rico hurricane in 2017. In a nutshell, DDR has the makings of a yield trap and investors should proceed with caution. If a stock's dividend yield looks too good to be true, it probably is. Excessive dividends are often unsustainable or result from a company taking on an excessive amount of leverage. A high yield doesn't necessarily mean that a stock is a good income investment, so be sure to look beyond the yield before you invest.